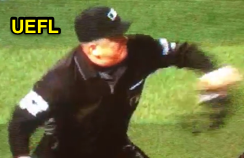 HP Umpire Mike Everitt ejected Rockies Manager Bud Black (balk no-call) in the top of the 5th inning of the Rockies-Giants game. With none out and one on, Rockies batter Trevor Story took a series of fastballs from Giants pitcher Jonny Cueto (all officiated properly). Replays indicate Cueto's delivery was legal from Set Position; he came to a complete stop prior to delivering to Story, the call was correct; Rockies pitcher Tyler Anderson had been called for two balks earlier in the game. * At the time of the ejection, the Giants were leading, 4-0. The Giants ultimately won the contest, 8-2. This is Mike Everitt (57)'s first ejection of the 2017 MLB regular season. Mike Everitt now has 4 points in the UEFL Standings (0 Previous + 2 MLB + 2 Correct Call = 4). Crew Chief Mike Everitt now has 2 points in Crew Division (1 Previous + 1 Correct Call = 2). *Rule 6.02(a)(13) states, "If there is a runner, or runners, it is a balk when...The pitcher delivers the pitch from Set Position without coming to a stop." This is the fifth ejection report of 2017. This is the 3rd Manager ejection of 2017. This is Colorado's 1st ejection of 2017, T-1st in the NL West (COL, LAD 1; ARI, SF, SD 0). This is Bud Black's first ejection since June 11, 2015 (Jordan Baker; QOC = N [Fair/Foul]). This is Mike Everitt's first ejection since August 27, 2016 (JD Martinez; QOC = Y [Balls/Strikes]). Wrap: Colorado Rockies vs. San Francisco Giants, 4/14/17 | Video via "Read More"